BPA is proud to present its 2012 GM of the Year award to Bradley Johnson for over a decade of service to WBC while running Dune. The game's small but enthusiastic following has enjoyed a steady hand at the helm as the Illinois native has remained its one constant for the past 12 years. The game itself is a difficult and controversial one to pilot with its heavy tendency to draws or multi-player alliances making it hard to select one winner or even a set of finalist—yet the event has endured and the GM is praised for his efforts. So much so, that he owes his nomination and eventual victory to an enthusiastic endorsement from one of his players. Next time you wonder why your favorite event has not been chosen, ask yourself what you did to draw attention to your GM's efforts. 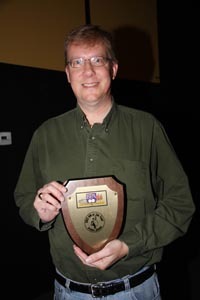 Bradley won the respect of his players by his dedication to the event which included a major restructuring of the rules for tournament play which has become the unofficial guide for Dune players all over the world. His frequent tweaks in search of better faction balance have kept the game from becoming stale. Thorough and timely presentation of annual event previews and After Action Reports that are always among the best presentations on the BPA site show his dedication. He also has provided Best Player Awards for each faction which have become prized in their own right and an inducement to play certain factions in an effort to collect an entire set as a sort of meta-prize. This recognition is Bradley's first inclusion in the BPA's Top Six GM votes but he made his first appearance an impressive one by winning the top honor. Dune, which usually draws in the 25-35 range, is the smallest event to gain this honor for its GM since Will Wible won for Republic of Rome in 1997. Bradley won with a score of 83 out of a possible 96 from our eight-member panel with three firsts, a second, and two thirds. His win once again relegated Ed Beach to runnerup status with a score of 77 despite three firsts as he garnered his sixth Top Six award for Here I Stand. Eric Brosius (Princes of Florence) earned one top vote and finished third with a score of 74 to earn his fourth Top Six pick. Pierre LeBoeuf (18XX) collected the remaining top vote to finish fourth at 61 and earned his third Top Six citation. Rounding out the Top Six were Tom Browne (Dominion) at 59 and Bill Morse (Grognards) at 55 who each garnered their first Top Six finishes. Bradley wins free accommodations at WBC 2013 for being our GM of the Year and our thanks for being the best of the best.